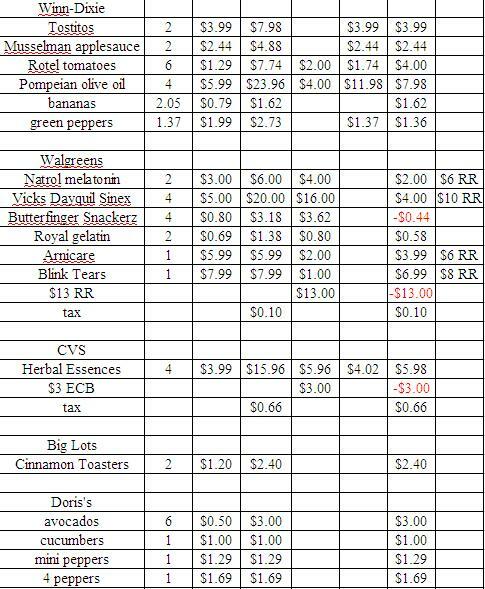 One of the ways I keep my grocery budget in line is by keeping a shopping spreadsheet. I originally got this idea from I Heart Publix - each week, Michelle posts all of the great deals she gets. When I started Frugal Follies, I wanted to do the same, to inspire you to save more as well. In the spreadsheet, I list every food, health and beauty product, paper goods, or cleaning supplies that I bought that week, and how much I spent and saved on the items. 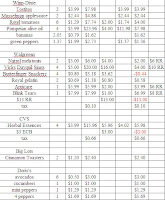 I publish my shopping spreadsheet every week, just before I post my Wednesday Weekly Shopping feature. It keeps you on track for how much you've spent that week. I make several shopping trips per week, and I enter the data after each trip, so I know how much more I can spend that week without being over budget. When I don't do this, I tend to go over budget, like I did two weeks ago. While entering the information, I'm checking the receipt closely, and if there has been a large mistake, I can go back to the store and fix it. This hasn't happened many times, but it feels good that I have the ability to do so. It helps me when I'm making my shopping list, to judge whether a deal is really a good deal or not. And now, I'm making the spreadsheet available to all of you! I've uploaded it to Google Docs, and you can download it yourself here. It's in Microsoft Excel format. To save it, right-click on the "Download Now" link, choose "Save link as...", then choose a folder and filename for the file. Column A: The product you purchased. I also take a separate line to list the store. Column B: The quantity of items you've purchased. For produce and other items bought per pound, I put the weight here. Column C: The original, non-sale shelf price of the item. This would be the sale price of the item plus the discount. For items bought per pound, I put the per-pound unit cost here. Column E: The dollar amount of coupons that you've used. If you've used multiple, similar coupons, you'll need to multiply the number of coupons you've used by the number of items you've bought. If you've used both store and manufacturer's coupons, you'll need to add those numbers together. Column F: The dollar amount of the discount given by the store. Column G: This is calculated for you - the amount of money paid out of pocket for the item. Column H: Here you can write any notes you might want, such as ECBs or RRs earned in the transaction, where you got the coupons from, etc. The bottom line of the spreadsheet is calculated for you. It will show the shelf price of all the items you purchased, the amount you saved through coupons and through discounts, and the amount you paid out of pocket. Tax: I put tax paid in Column D, overwriting the formula that appears in that box. ECBs and RRs - I put these in Column E by themselves. A negative total should appear in Column G.
I hope I haven't made this too confusing - it really is an easy way to keep track of what you're spending and saving. Hope this helps! For more frugal tips, please check out the bloggers listed on the left sidebar under Frugal Tips Linkups. There are lots of great ideas on each blog and I'm sure you'll find lots of wonderful tips! I also track my savings and spending. It is such an eye opener! Thanks for sharing your spreadsheet! I have no doubt that keeping track of this stuff would motivate me to shop smarter.